At the Grassroots . . .
We have set up a Solar - Wind Hybrid System (another first in the Himalayas) at the impossible height of 14000 feet in village Lossar. The system provides electricity for several community facilities and some households, and ensures energy security for the Lossarites through the bitter -40oC and frequently power-less winters. The system has also launched the concept of a Common Energy Facility for electrification of remote villages. Several farmers in the Himalayas have successfully established microplantations of medicinal plants and have begun reaping revenues from their harvests of Dactylorhiza hatagirea and Aconitum heterophyllum. The first Medplants Growers Cooperative in the Himalayas has been established by Pragya and is today a vibrant 400-member body actively promoting medicinal plants cultivation within Lahaul valley and its produce in faraway markets like Delhi. Select dying crafts of the Himalayas are on the verge of revival through effective product upgradation & diversification. In Spiti, for instance, women’s groups have taken up the weaving of lingche - the beautifully embroidered stoles. The art of thanam weaving in Lahaul and rari-weaving in Lachen are receiving focused impetus. Several Pragya facilitated community institutions have begun managing their natural & cultural heritage on sound professional lines. These include the Lahaul Amchi Society, Tawang Heritage Preservation Council, et al. Some of them are managing Culture Promotion Centres, others run Community Afforestation Drives, and still others are carrying out Policy Advocacy Programmes. For Science & Policy . . .
A pioneering and mammoth exercise has been carried out of mapping the herbal wealth of the high altitude belt of the Indian Himalayas. Primary data on a total of 2383 species has been collected. Invaluable knowledge, about the species collected as well as the ethnobotanic traditions of these regions, has also been collected which is displayed in 3 Ethnobotanic Museums across the Himalayas. 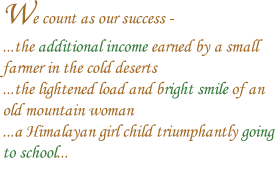 We have succeeded in getting women’s role in management of natural resources recognised. A study on Women & Common Property Resources (CPR) in the eastern Himalayas, involved rural women from the region in evaluating and upgrading their NRM practices, and advocated for their participation in NRM related decision making, and in grassroots CPR management institutions. We have raised awareness of ‘cold deserts’ as a distinctive biome and have helped the Government of India recast its Desert Development Programme (DDP) to address the unique features of cold deserts. A model for the appropriate development of cold deserts has been suggested by the organisation. We have sensitised the National Council for Educational Research & Training (Government of India) to the special curricular needs of the Himalayan region and through a multi-stakeholder advocacy initiative, contributed to the formation of Himalaya-specific policies in the national five-year plan for education. Awards - National & International . . .
Our project on “Conservation & Sustainable Utilisation of Medicinal & Aromatic Plants�? was awarded the Whitley Award, in the year 2000, by the Whitley Foundation for Nature Conservation in collaboration with the Royal Geographical Society, London. We beat 67 other applicants to win this honour from HRH Princess Anne of Britain. In the year 2000, the Pragya project in Himachal Pradesh was selected as an RGS-IBG (Royal Geographical Society - Institute of British Geographers) Action Station. We have won the prestigious International Energy Globe Award, 2005 for our project “MV Power: Renewables-based Common Energy Facilities for Remote Mountain Villages in the Cold Deserts of the Indian Himalayas�?, beating 220 other contestants in the category. This “World Award for Sustainability" is presented to the best-implemented projects from around the world, which contribute to the protection of the four basic elements of life - air, water, wind and earth, thereby providing valuable assistance in the preservation of our planet. Ms. Gargi Banerji (Director, Pragya) was selected for the MSDS National Award for Excellence in Social Work in the year 2007. Ms. Gargi Banerji and Mr. Sunil Pillai (Directors, Pragya) are recipients of the National HRD Network (India) Citation for Social Entrepreneurs in 2008. The Pragya programme on “Education for the Marginalised�? won the STARS Impact Award, 2010 for its path-breaking work on education for children among the most remote and difficult parts of the world. These are micro or small enterprises based on the traditional arts and crafts of a region. HBEs have been found to have a number of advantages: they are usually easily acceptable as occupations to the community; the skill-base and inputs required for them are amply available in the community and region; they typically do not require high technology or high investment; they are usually environmentally suitable for the region; they are suitable for home-based or small-scale enterprises, and thus appropriate for low population density mountain regions. The problems usually lie in the loss of functionality of the products in the modern market, the low productivity and quality standards against the current requirements, and the lack of marketing infrastructure and efforts. Appropriate product modification and tool upgradation along with requisite marketing provide not only a successful rural enterprise option, but also help preserve the heritage of traditional crafts. Conservation cannot wish away the issues that have given rise to the need for conservation in the first place. Nor can prohibition conserve completely. The biophysical aspects of a region are as much a cultural as an ecological phenomenon, and the indigenous peoples as traditional stewards of these bioresources need to participate fully in their preservation, just as much as in their own development. The responsibility of managing these bioresources in a sustainable manner has to be centred with the indigenous communities, tying the development of these communities with the conservation of their ecosystems. Locally instituted and managed harvesting limits and appropriate harvesting practices can ensure required levels of regeneration. The market forces that play have to be accepted and managed, ensuring the sustainable use of bioresources and the benefit of host communities, by instituting appropriate alternatives, such as cultivating medicinal plants as against collection from the wild. To institute sustainable change it is necessary to study the complete influence system and involve all ‘key influencers’ of the target community/region. These could include teachers, administrative officials, political and spiritual leaders, and other educated and respected members of society. ‘Key influencers’ have a very high demonstration value and catalysing capability. They can also visualise the long-term impacts more readily. Programmes also need to target all strata of the society to achieve success, and not just the ‘poorest of the poor’, although special attention must be given to this lowest economic stratum. This will ensure community ownership as well as enhance project viability since the higher strata frequently have greater capacity. To bring about quick change it is important to involve many small change torchbearers. A first task of instituting a programme must involve identifying the ‘ready to change’ and ‘most likely to change’ members of the community. These must then be facilitated to become ‘early adopters’ of the programme. Typically ‘early adopters’ have a very high ‘increase the flock’ tendency, and can thus motivate many others to also take up the programme. Much that is truly valuable and locally appropriate lies in old wisdoms and traditional practices, albeit rusty and frequently eroding. Traditional knowledge systems are often more holistic and conservation-oriented. Modern-day problems are however better served through modern technological developments, which also have the advantages of higher productivity and quicker impact. It is important therefore to blend the two (the traditional and the modern), thus retaining the ‘valued wisdoms’ while bringing in the required ‘new themes’. An added advantage of such technology adaptations is that they are more easily implementable, as they use local materials, are oriented to unique features of the local environment and culture, and are similar to traditional techniques and hence more acceptable to the local community. Old, as it is said, is gold! The societies inhabiting the Himalayas have a rich cultural legacy that finds material expression in their variegated handicrafts, artefacts, ornaments and the like. Much of this precious history however is lost and even forgotten or devalued in the host communities themselves. Preservation of a thing has greatest value when it is in the same medium it originally rested in. Besides, if a culture preservation intervention were to be anchored in the host community and area, it is quite likely that it would lead to a resurgence of the same form. In Lahaul & Spiti Pragya has established rural museums, which store the ancient artefacts, handicraft items, ornaments, utensils and other objects of human interest & value. Located in roadside villages - one each in Lahaul and in Spiti - these rural museums showcase such objects (i.e. ancient artefacts, handicraft items, etc. ), all of which have been donated by the community. The facility is being independently run and managed by the local community. And the hypothesis is being proved right - the rural museums have generated enormous pride in the local community in its own heritage.